Ed Wallace during the lunchtime panel at the recent Citizens Budget Commission (CBC) conference. Wallace serves as vice chair and outside general counsel for the CBC and is co-chair of the New York City office of award-winning global law firm Greenberg Traurig LLP. 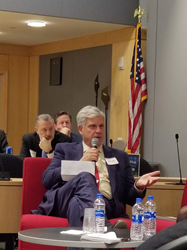 Participating on Wallace’s panel were reporters Laura Nahmias with POLITICO New York and Jimmy Vielkind from the Wall Street Journal; and New York Post editorial board member Michael Benjamin. The conference was held Dec. 17 at SUNY Global Center. Video of Wallace’s panel can be viewed at this link. Wallace was recently named number 12 on City & State’s 2018 “Manhattan Power 50” list. He is the highest-ranked practicing attorney on the list. He has been listed in multiple editions of The Best Lawyers in America and Super Lawyers, and is rated AV Preeminent® by Martindale-Hubbell. In 1981, Wallace became the then-youngest city council member in New York City representing the Borough of Manhattan. Wallace began his career in the Chelsea-neighborhood office of the Legal Aid Society. From 1986 to 1992, he served as vice president for finance at Mort Zuckerman’s Boston Properties. From 2012-2014, Wallace was chair of New Yorkers for Parks (NY4P), which The New York Times called “the city’s leading parks advocacy group,” and he now sits on the NY4P Board. He is on the executive committee of the French-American Foundation Board.